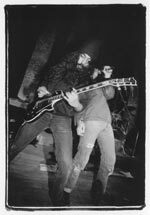 soundgarden's kim thayil, july 1988.
a night to remember - soundgarden opened for redd kross at seattle's central tavern. 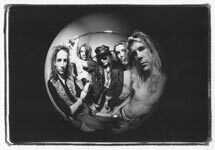 green river promo shot, 1987.
from left to right: stone gossard, mark arm, jeff ament, alex vincent and bruce fairweather. 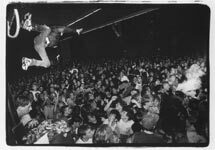 these gentlemen went on to form other bands, including mudhoney, pearl jam, love battery and mother love bone. 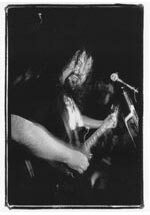 tad doyle, frontman for tad and o.g. 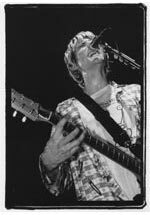 (original grunge). 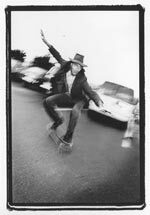 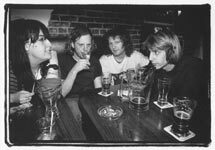 northshore surf club, olympia, wa, 1991.
throwing back the booze with kim warnick of the fastbacks and mudhoney fellas dan peters, matt lukin and mark arm. 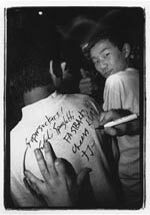 enthusiastic fans collect autographs at the japan lame fest 1993.
the sold out tour included seaweed, supersuckers, fastbacks and japan's own supersnazz.